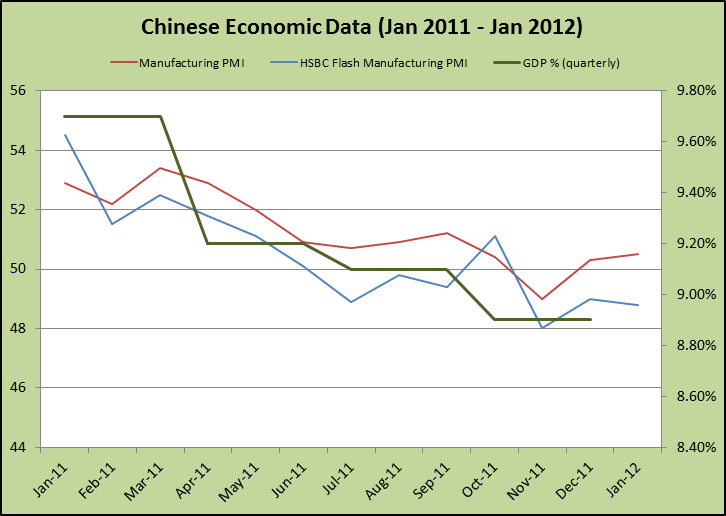 What Are the Chinese PMI Reports and Why Should I Care? Once again, I’ve decided to help educate you, my beloved students, by organizing today’s piece in a question-and-answer format. This time, I’ll be giving you the 411 on the two major Chinese Manufacturing PMI reports. There will be two types of answers. The first is the straight-from-the-textbook answer. I’m sure nerds like Jeremy Lin will appreciate this. The second is a “street” answer for all my homies who wanna keep it real. What exactly are the Chinese PMI reports? Formal Answer: PMI stands for purchasing managers’ index. For China, there are two major reports available to the public. The first is the Chinese PMI, which is conducted by the Chinese Federation of Logistics and Purchasing and is released on the first day of every month. The report is a leading indicator of China’s economic health based on a survey on purchasing managers. The index reflects the views of about 800 purchasing managers on current and future economic conditions, including their expectations on a number of factors such as employment, prices, production, etc. The second report is the HSBC Manufacturing PMI. HSBC conducts surveys in partnership with the financial information services company, Markit, and releases two versions of the report: the Flash and the Final. The surveys are sent to over 400 manufacturing companies. In order to give an accurate picture of the Chinese manufacturing sector, the set of surveyed companies is made up of small, medium, and large manufacturers and include both public and private corporations. Street Answer: The Chinese government and HSBC be acting like bookies yo. They put up odds on how well managers think the Chinese economy will do over the medium-term. Some playas pay more attention to the HSBC report though, since it’s by a “third-party” source. They just don’t trust the Chinese government, baby! How are the two reports measured? Formal answer: The line-in-the-sand number is 50.0. Figures above 50.0 indicate optimism for the Chinese manufacturing sector, which means we could see expansion in those industries. On the other hand, scores below 50.0 hint at pessimism amongst managers, which could lead to contraction in manufacturing industries. Street Answer: 50.0 = Matt Damon in Good Will Hunting. Above 50.0 = Al Pacino in the Godfather. Below 50.0 = Ben Affleck in everything he’s ever done. Why are these reports important and how do I use them to trade? Formal answer: Investors and traders monitor these reports because of the global economy’s reliance on Chinese growth. Not only is China now the world’s second largest economy, but it’s also the fastest-growing major economy. It plays a big role in global trade as it’s both the top exporter and the second largest importer in the world. Australia, in particular, is extra sensitive to Chinese data as 25% of its exports find their way to China. When China is doing well, we can probably expect to see an improvement in risk sentiment, as demand perks up, which should lead to increased production around the world. We should see the opposite happen when China isn’t doing as well. Street answer: It’s simple, fellas. Risk is on like Donkey Kong when the Chinese PMI is up, and risk is off like David Hasselhoff when the PMI is down. Ya dig? Will Chinese GDP growth be higher than 9% in 2012?